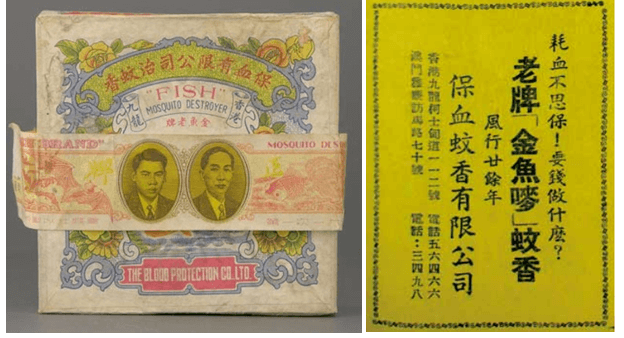 Left: old package of Blood Protection Co’s Fish mosquito destroyer featuring the portrait of its founder H.L. Sum (right) and his brother/son. Right: Blood Protection Co’s ad from the early 1960s – the tagline reads what’s the point of having money when you cannot protect your blood. The warm and rainy climate of South China and Southeast Asia makes it the perfect breeding ground for mosquitos and created a huge market for mosquito repellants as a result (one source cited that the region accounts for 80% of mosquito repellant sales and also production). One of the more traditional mosquito repellants is mosquito incense (蚊香, typically packaged in coils) and for close to a century, a firm by the name of Blood Protection Co out of HK and Macau had been a leading maker of mosquito incense in the region under the Fish (金魚牌) and Dorfook (多福牌) brands of “Mosquito Destroyers”. Blood Protection Co was founded in 1919 by Sum Heung-lam (沈香林, aka H.L. Sum, 1892-1960) and 4 other co-founders. According to his obituary, the ancestors of H.L. Sum came from Fukien province but the family had settled in Macau for generations. He had worked as Chinese manager of the shipping department of Jardines and in mining earlier in his career before starting Blood Protection. In 1921 when the firm registered its trademark in HK, its office was listed as 36 Shanghai Street in Kowloon. The first decade for Blood Protection was difficult and 4 of the 5 co-founders dropped out by year 6, leaving Sum the sole proprietor. By 1927, its address was listed as 314-316 Nathan Road in Kowloon and the firm was incorporated in 1929.
Business started to prosper in 1930 with majority of its outputs exported to Southeast Asia and the rest sold domestically and other parts of the world (San Francisco, Portugal and Mozambique were three of the locations mentioned). Production were done in Macau at the intersection of Rua Francisco Xavier Pereira and Avenida do Ouvidor Arriaga which employed up to 500 workers and also its HK plant which according to one survey had 200 workers and 70,000 sq ft premise before the War. Raw materials at the time came from Guangzhou and Yangjiang in Guangdong province and Japan which were cut into stripes by machines at the plant and then turned into coils, dried and packaged by workers. Outside of work, H.L. Sum was a devout Buddhist leader who was a major benefactor and advisor to the HK Buddhist Association (HKBA) and resided in Tung Kok Terrace(東覺台) which was next to the Ten Thousand Buddha and Sai Lam Buddhist temples in Shatin. He served as a director of the Tung Wah Hospitals in HK (1932) and Kiang Wu Hospital in Macau. At the time of his death in December 1960, H.L. Sum bequeathed 700,000 sq ft of land in Pak Tin Village (白田村) in Sha Tin (沙田) to the HKBA for the construction of a Buddhist hospital. The hospital was never built but the land was eventually sold for $7.3 million in 1974 which HKBA used to acquire 23 Connaught Road in Central as an investment property and the building was named Heung Lam Building (香林大廈) in H.L.’s honor in 1976. After H.L.’s death, his son Sum Tung-fook (沈東福) and his nephew Franklin T.K. Sham (沈東强) took over the family business and served as chairman and managing director respectively. In the 1960s, the mosquito incense industry in HK and Macau faced headwinds in the sales front from Japanese and mainland Chinese competitors and in the cost front from rising cost of raw materials from Africa. As Malaysia was a key market, the Sums decided to shift production there in 1963 by forming a joint venture called Blood Protection Co (M) Sdn Bhd with local partners (49% Blood Protection and 51% local). In December 1964, the Sum family shut down the Blood Protection plant in Macau and the site was later re-developed into a residential complex – Heong Lam San Chun (香林新邨) in honor of H.L. Sum. In July 1965, the Malaysian plant at the new Mak Mandin industrial town at Butterworth, Penang commenced production and in its first year manufactured over 17 million coils of mosquito incense and captured 25 percent of the Malaysian market. The plant was briefly closed in April 1966 due to intense competition but later resumed and continues operations to this day. H.L. widow Ma Shui-ying (馬瑞英, 1908-1995) served on the board of Blood Protection and the HK Buddhist Association for many years and through the H.L. Sum Foundation contributed tens of millions to the construction of the Buddhist Sum Heung-lam Memorial College in Tuen Mun (1978), the Buddhist Sum Tung-fook Kindergarten in Sheung Shui (1982) and HK Buddhist Sum Ma Shui-ying Care and Attention Home for the Elderly in Ngau Tau Kok(1983). Outside of business, her son Sum Tung-fook was also very active in the community, having served as director of Tung Wah Group of Hospitals (1959) and chairman of Sha Tin Athletic Association, Kam Chuen Tai-chi Association and Kuang Hwa Athletic Association. Currently the business is managed by the third generation of the family. This article was first posted on 25th December 2017.